When I first moved to Seattle, one thing I had to grow accustomed to was the homeless population. And since I had to work a block away from a homeless clinic, I had to adjust quickly. Initially, this group made me uncomfortable. My parents raised me in the suburbs, and we hardly ever saw someone holding a cardboard sign on the streets. And since Seattle Pacific University sits in one of the nicer parts of the city, students and staff don’t have to witness many homeless people around campus. However, instead of ignoring this growing population, we should be looking for a way to help them, even if just in a small way. According to the Committees to End Homelessness, “8,830 individuals were counted on the January 27, 2012 One Night Count homeless street count and survey data” within the city of Seattle. Over a quarter of these people are surviving on the streets without any form of shelter. These numbers are steadily rising, partially due to the terrible economy. People lose their homes for a bunch of reasons, many which are outside of the individual’s control. Despite this large group, many of us don’t know hot to react when we pass a homeless person on the street asking for help. Do I stop and talk to him? Drop a few coins and keep walking? Nothing at all? 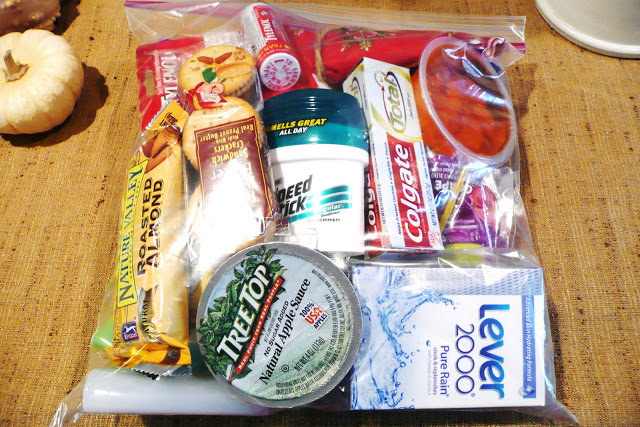 One easy but meaningful way to help those on the street is by keeping Blessing Bags around. They cost little to make, and mean a lot to those you give them to. You can fill up gallon bags to keep in your car’s trunk, or smaller quart-sized bags in your walking bag. Nonperishable food like trail mix, granola bars, beef jerky, crackers, ect. If nothing else, I’ve found that making eye contact and offering a smile can be just a good as giving material goods sometimes. Categories: Community Involvement | Tags: blessing bag, Community involvement, homelessness, Seattle | Permalink.